I am a gardener, a singer, a professor, a cook. I love vibrant colors and fine details. I write, I teach, I sing, I plant, I cook. My hair is beginning to grow back and I think it is going to be curly. Cool. I spent a year away from my garden and my blog, focusing instead on endometrial cancer. That explains my bald head. I can’t say that i sailed through chemo and radiation, but I made the best of things. I was through with treatment and eager to get back into a life that didn’t involve toxic drugs, radiation, and endless doctors’ appointments But I needed one more procedure. In March I lost my gallbladder because there was a slim chance there was a cancerous polyp hiding in there. But, there was no cancer. And now I’m suffering from the lack of a gallbladder. Such a lovely little hellebore. Nothing is going to keep me from enjoying my garden this summer. There isn’t much blooming yet, but the garden is full of green anticipation. At the moment everything that blooms is pink. What I love about the hellebore here is that it gets darker and “moodier” as it ages. A friend gave me this little beauty and it sits right outside my back door. And, I cannot resist falling in love with my pink bleeding hearts. This one outside my back door is always ahead of the one planted in a lush corner of the Secret Garden. My garden friend saw a redbud at a garden center so he borrowed a truck, and I now have a lovely redbud that will give my hydrangeas some desperately needed shade. Someday. These lovely chains of flowers are so lovely. Each spring they greet me. Hello, Redbud. Welcome to my garden. Several years ago I went to a gardener’s conference in Toronto. That is where I fell in love with allium. What a frustrating day! I should be in Minneapolis enjoying the camaraderie of fellow bloggers and some amazing gardens. But, I’m stuck in Chicago because of travel problems. I can’t blame the airlines, though. I missed my flight, and tried to get to Minneapolis on standby via Chicago. As it turns out, I just can’t get a break on flights out of Chicago. So, I’m staying in my niece’s apartment in the loop and hoping my luggage gets to me. Unlike me, my luggage is in Minneapolis. I planted a number of gazania in the Secret Garden and I’m enjoying the grey foliage and lovely pink and white blooms. This is Red Pinnacle and isn’t she gorgeous. This is another daylily I planted late last summer. Purple Coneflowers in the Secret Garden. The white in the distance is Fragrant Angel. I do not recall what the purple ones are. That is Grosso Lavende behind the purple coneflowers. I’m not sure what variety the purple coneflowers in the foreground are, but the white ones behind it are Fragrant Angel. That is Grosso lavender next to the purple. Bridget, my Standard Poodle, looking proud amongst the daylilies in the Secret Garden. That is Crystal Pinot near her nose and Barbara Mitchell to the left. Behind her is a purple coneflower that I thought did not survive. But, there it is. 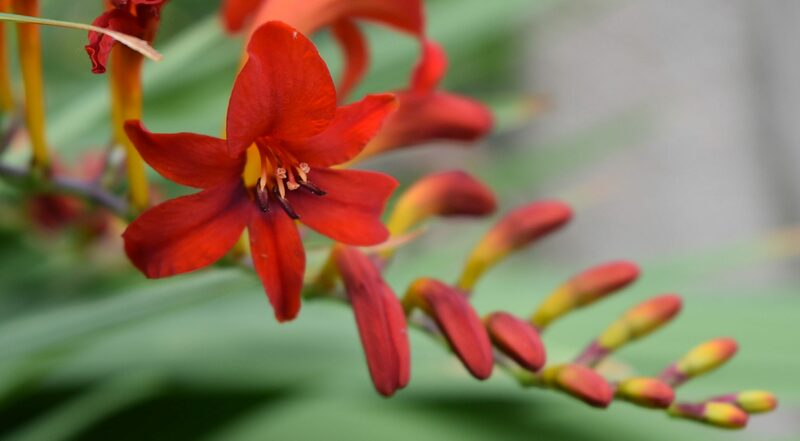 The crocosmia is starting to bloom. I seriously thinned this patch late last summer to give the day lilies breathing room. In the little nook outside the dining room and sun porch this finicky variated lace cap hydrangea is enjoying a bumper crop of blooms. This is evidence that hydrangeas love cool, wet springs. The carpet rose is flourishing in the rosebed. Love this riot of daylily blooms. Zagreb and Moonbeam coreopsis are in the bottom right, followed by Rosey Returns daylily. That is supposed to be Crystal Pinot in the lower left, but it either reverted to a parent or self seeded into something else. Next to it is Sea Urchin. The yellow is First Knight. The peachy flower mid-right is Siloam, one of last summer’s additions. I’m loving this Euphorbia Perkinensis in the Secret Garden. Despite my liberal and multiple applications of acid, my Endless Summer hydrangea in the lower garden is only partially and lukewarm-edly blue. Another one of last summer’s purchases, drumstick allium. I can’t wait for these to multiply and fill a space in the Secret Garden. Meet Strutters’ Ball, a daylily I planted late last summer. This little clump of pink astilbe brightens up the hosta bed underneath the kousa dogwood in the Secret Garden. I thought this nameless clematis was finished blooming, but suddenly it decided to settle into a second bloom wind. The the giant allium finished blooming weeks and weeks ago, their seed pods make for an interesting display. Another shot of allium seed pods. They look like fireworks! Alchemilla or Lady’s Mantle adds a wonderfully bright chartreuse. The Walker’s Low catmint is beginning to fade, but it the bees still swarm to it. Here is the bed in the entrance garden, complete with cat statue. More of the entrance garden. I love how the pots of geraniums warm up the corner. I love how the impatiens peak out amongst the hostas and heucheras under the magnolia tree. This White Dawn climber has struggled the past couple of years. It seems to be doing better this year, probably because our winter wasn’t as hard as the two previous ones. The rose medallion is doing its thing. That’s a red Knock Out rose on the left. The white rose is a hansa rose that is very fragrant. The annuals really keep this little nook cheerful. That is an un-named white climbing rose in the corner, a gift from a neighbor. Like the White Dawn, it has struggled but seems a bit healthier this year. I’m waiting for the annuals to grow into this space. I ripped out a row of white dome hydrangeas and decided to fill the space with tall zinnias in order to give myself some time to decide what to plant instead. Here is another space that was altered last fall. I pulled out a bridal veil spirea and am enjoying the opening it left. The hellebores are still hanging onto their blooms which have dried and provide a nice effect. I love the hosta bed under the old cherry tree. Seboldiana Elegans is about to bloom. Here is another look at the kousa dogwood. The kousa dogwood is in full bloom. What a gorgeous tree. I’ve been diligently adding acid to my hydgrangeas hoping to get blue flowers. This nikko has never kicked out this many blooms, so perhaps the wet cool spring and the acid will work its magic. Lady’s Mantle (alchemilla mollis) is in full bloom. I love to cut it for bouquets. That is grosso lavender in the background, and a hansa rose to the left. All winter I dream of June and green foliage, garden centers, freshly unfurled hostas, and deep red poppies. I dream of lilacs and budded hydrangeas, of marigold flats and petunia pots, of warm days and evening rains. And, now I’m here. In June. The heat hasn’t yet squatted on the gardens. The peonies are blooming, nodding now under the weight of heavy blooms and last night’s rains. Winter’s toll has been tallied, mourned, and ultimately dismissed. There will always be more plants. The marigolds are in the ground and the petunia pots are nestled in their more attractive garden pots. And all the bees have awakened. It is late spring when the days are almost as long as they will be and house sparrows chitter in the bird house. This mason bee was dining on catmint near the cherry tree. This June brings a few surprises. One is the mock orange. It’s never kicked out very many bloom, but that may have been because the McFarlane lilacs I planted with it bullied MO into a dark corner. Last summer the lilacs got a good pruning. And MO is now covered in blooms. I planted it for its scent, but the lilacs still give off a headier perfume than MO. Mock Orange (Philadephus) was brought to European gardens from the Ottoman Empire in the 1500’s. It is often used in park plantings because it is such a reliable bloomer and some species are very fragrant. Unfortunately, mine is a less fragrant variety. I assumed all MO’s were heavily scented so I didn’t pay attention to the species I purchased. And, I vaguely recall I bought it late in the season when everything was on sale, so the price was more intoxicating than the fragrance turned out to be. Another surprise wasn’t so much a surprise as it was a fruitful anticipation. A year ago I attended the Garden Bloggers’ Fling in Toronto and saw so many gardens with tall allium growing. Some of the gardens were formal and understated. Others were free flowing narratives of color and texture. But most had tall allium. I knew I wanted to see those beautiful globes of tiny flowers in my gardens, so I ordered a number of varieties online. But the giant allium were the most spectacular. I know I want more of them! Giant allium, still lovely when the color goes.